With regard to the good question "knowledge generated by whom?" there is an old construct that I find useful when doing workshops and training. In simple terms it starts with the idea of organizational structures and social processes surrounded by a cloud of DATA which only becomes INFORMATION as it is organized through some process of analysis, concern and possible intent. Information becomes KNOWLEDGE when it becomes part of the SKILLS SET/CAPABILITIES of an individual, an organization, a process or a community. The analysis frequently stops there with DATA>INFORMATION>KNOWLEDGE. We take it one step further and argue that knowledge only has meaning in CONTEXT and with used with WISDOM. assessing the relevant individual, organizational or community WISDOM to properly apply knowledge in context. Summary prepared, with thanks, by Ewen Le Borgne. One of the most active discussions in the long time (and on KM4DEV that is not insignificant), this discussion started on the fringes of a discussion about 'Knowledge generation, what/where/why?' 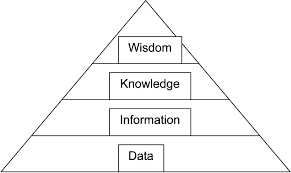 on 1 February 2010 when a member on the list referred to the old DIKW model (data-information-knowledge-wisdom). References to this model really triggered a flurry (and fury) of emails, particularly after Dave Snowden's intervention, dismissing the model as irrelevant and dangerous and stating that 'Anyone talking about wisdom as a higher level of knowledge should be taken out and shot for the good of the field'. This was a great opportunity to reflect about the model and ponder about its limitations. This entry summarises the key points in the debate. The discussion thus started with this idea of using the DIKW model to explain the difference between all these terms. 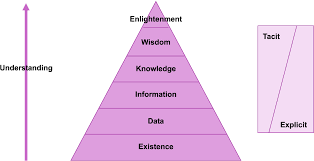 The specific reference to wisdom as an additional layer that helps contextualise knowledge and make it relevant caused the controversial statement by D. Snowden. It caused a number of messages about the acceptance of this model as a working model (or not) for the KM field. A few referred to the importance of definitions to clear some doubts by people exposed to KM at the beginning. Others insisted about the importance of looking beyond data to explain knowledge and finally the crux of the matter was addressed: What some refute in this DIKW model is the linearity of the continuum D-I-K-W as well as its cultural limitation (failing to accommodate uncodified and unarticulated 'naturalistic' knowledge of the zen, sufis or even London Cab drivers. Then Patrick Lambe made a crucial contribution to replace the DIKW debate in a historical perspective, explaining why the model has been used to legitimise computer/information science as valid and useful but was not meant to accommodate more complex considerations from e.g. a KM perspective. Knowledge should also not be perceived as a result from data and information but rather data is the result of 'knowledge-driven purposeful piece of design work'. Essentially, DIKW is a managerial model to explain how one can make use of data. He pursued arguing why this model became received wisdom (see detailed discussion or full transcript at the bottom for more). Another point made later is that DIKW can be a useful model to explain the visibility/tangibility of different elements: We see a lot of data, less information, knowledge becomes opaque and wisdom a mystery? This is perhaps a reason explaining the success of the model: it makes it easier to focus on the visible stuff (data / info) but that approach often fails to address the most critical needs. Another contribution pointed to the difference between subject (knowledge is a human emergent behaviour) and object (data and information can be captured). In other words D&I are part of a physical reality while K&W are part of our "inner universe". Yet another contribution asserted that knowledge could be identified with 'sets of consensual beliefs in a given context' as a result of transactions within a given community and that information could allow us to 'accumulate the outcome of these transactions' while wisdom would be the 'capacity to apply collective believes in new situations'. The discussion then moved on to positive deviance (should be another wiki entry topic) and the fact that we fail to understand what motivates the behaviour of such people and we do not focus on the data, information and knowledge that seem to inform this behaviour either. (the genesis of this discussion) Data becomes information when organised through analysis, concern and possible intent. Information becomes knowledge when it becomes part of skillset / capabilities of an individual/organisation/community. Wisdom allows us to properly apply knowledge in context (S. Lanfranco). Information stems from dialogue between people and now and then some data's added. People share information by talking to (or doing action-research) together and meanwhile they develops skills/experience. They can document this (write it down) but to learn, this information needs to be fed back in the dialogue and the cycle starts anew (J. Pels). (the controversial message) The DIKW model is plain wrong, difficult to explain and leads to bad labels. Knowledge helps us create information from data and if we share knowledge we can understand information. Wisdom as a higher level of knowledge is ludicrous (D. Snowden). Surprising to see that this well accepted model is debated again as it is helpful to explain the notions as a means of storytelling to transfer knowledge (P. Hall). Show examples of wisdom management or higher levels of knowledge that is not pretentious and I will agree (D. Snowden). Though DIKW didn't help much it's useful to have working definitions to distinguish the terms. Wisdom doesn't help here. It is the capacity to make right decisions on the basis of what's known/available, i.e. applied knowledge. Wisdom management doesn't make sense here (J. Schunter). How can wisdom be regarded as following objective and universal categories? KM every so often falls into the trap of treating human decision-making as intrinsically wise, provided that it is based on sufficient information / knowledge. We should reflect debates on what norms and decisions can be considered wiser while knowing that these foundations are constantly contested (B. Kumpf). Agree w/ D. Snowden, DIKW's based on analogy of processing databases, which is a different pathway than knowledge generation. Most (useful) knowledge for development is not in databases but structured in stories, feelings, patterns, rules of thumb, analogies, concepts, narratives, insights, guesses and portfolio of cases, inside living brains. The challenge is to be sensitive, open and intelligent enough to interact constructively with these forms of knowledge (S. Mendonça Ferreira). The danger of the model is in its linearity and hierarchy. Management science simply hasn't put as much effort into understanding knowledge than the history of philosophy. The DIKW model also fails to account of shamanistic knowledge & narrative Sufi philosophical traditions. It is therefore a culturally limited and inadequate model, closely followed in fallacy by the SECI model and it is responsible for 1000 failed KM initiatives. It forces people to think of knowledge as a thing, rather than a flow. On the other hand it is useful to see information as a structured form of data. But down the line, shared context is key for information flow and the purpose of KM is to create shared context (information, experience, education etc.) to all this to take place (D. Snowden). This is not about thrashing models but about being able to use wisdom/sagacity to know when to apply what. To do that we need a transdisciplinary knowledge and experience base and the ease to move between these depending on circumstances, needs and goals (W. Ho). I agree that all perspectives are limited but it doesn't follow that all perspectives have either value or validity (D. Snowden). "We have oceans of data, rivers of information, some pools of knowledge and a very few drops of wisdom. Note, not a hierarchy but shifts in communication channels" (V. Brown). Boisot is a useful writer here. His I-space model respects but moves beyond the IT tradition. One of his key sub-models contains the spectrum of knowledge from zen-narrative-symbolic. DIKW works only in the symbolic, hence the issues we have with it (D. Snowden). Reference to David Weinberger's article (see 'Further information' section) 'The problem with the DIKW hierarchy'. The article goes back to the fundamental flaw of establishing a hierarchy between the four terms and also mentions this interesting bit about knowledge: "But knowledge is not a result merely of filtering or algorithms. It results from a far more complex process that is social, goal-driven, contextual, and culturally-bound. We get to knowledge — especially "actionable" knowledge — by having desires and curiosity, through plotting and play, by being wrong more often than right, by talking with others and forming social bonds, by applying methods and then backing away from them, by calculation and serendipity, by rationality and intuition, by institutional processes and social roles. Most important in this regard, where the decisions are tough and knowledge is hard to come by, knowledge is not determined by information, for it is the knowing process that first decides which information is relevant, and how it is to be used." We could identify knowledge with sets of consensual beliefs in a given context. They are the result of the transactions within the community. Information allows us to accumulate the outcome of these transactions. Wisdom is the capacity to apply these collective beliefs in new situations... The web 2.0 is the biggest codification adventure of mankind generating a mesh of information taht approximates to knowledge (A. Acuna). "Don't you also think that data is separated from information as raw bits of text are separated from intentionally structured bits of text like books, articles, video documentaries etc. ? ... I prefer referring to the act of knowing than knowledge indeed as it is all about conjuring up all the things we have in ourselves to make (supposedly) better informed decisions, which could be ideas or facts... On wisdom, how about it being 'accumulated / analysed experience which allows us to make a better informed decision in a known or unknown context? (E. Le Borgne). It's the process of abstraction and codification that creates information from data (and requires a shared knowledge base). The knowledge base (common levels of abstraction, understanding of the conventions of codification) are what allows that process to take place... I'm happy if you want to talk about wisdom in the context of judgement (making choices etc. per your text) but that is one aspect there are several others... The whole point is that its not a linear process. You can have two boxes labeled DATA and INFORMATION and a double headed arrow connecting them (as it can go both ways); then a fussy cloud labeled knowledge between them. Wisdom may be the ability not to try to go beyond that. (D. Snowden). The DIKW promotes an artificial hierarchy and a false notion of a linear sequence of transformations. The model also lacks the negative companion to each of the elements (non data, non information etc.) (M. Menou). There are no absolutes and no agreement on the way to go from there to here (nor about what is there and what is here for that matter). Within this cloud of uncertainty one has to choose between the risks of evidence based decision making and some faith based decision making. I for one prefer the risks of evidence based decision making. One can learn from it. Successful design takes a lot of wisdom. We can argue about what it is, but we, as individuals and as communities had better pay some attention to where it comes from and how we deploy it, at least if we want to get beyond rhetoric to action, and move some bit toward there from here. (S. Lanfranco).